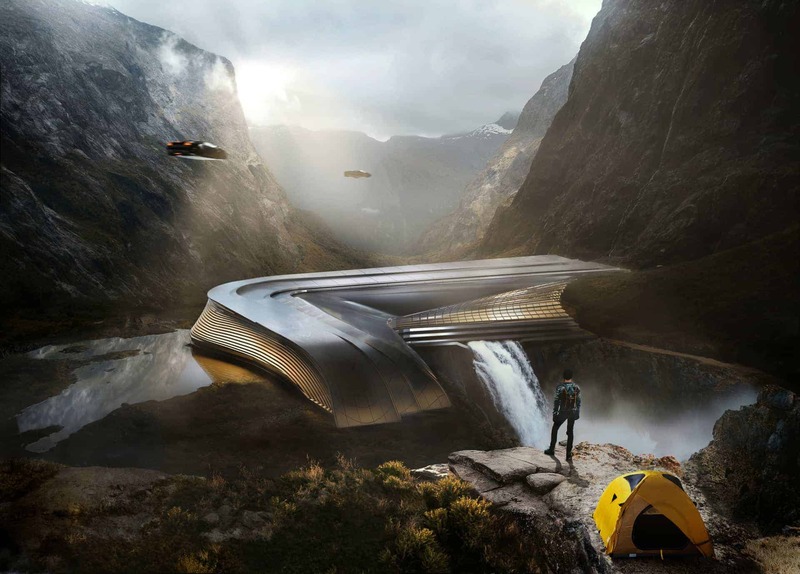 Flekkerfjord Concept visitor centre is futuristic architecture concept made as a visual presentation in CG graphics and matte-painting technics In those images, I showed a future architecture interacted with nature and technologies. Wavy form shape building stand on the waterfall retreat. Fstorm render chose as main with matte-painting, just a perfect combination to create artwork images combining those 2 technics. The main idea of project images is based on the interaction between futurist technologies add traveling lifestyle. The shape of the building interacts with landscape nature with spectacular views of Norway. Main building shape has wavy organic form stayed on waterfall retreat, showing in this project how technology and futurism may fit with cliffs and nature with mountain view. It’s a piece of shelter to get hide in and enjoy. Well, it’s the first time I’ve been using matte-painting technics and 3d renders, it’s digital artist perfect combo for creating large detailed images. When you’re working with lot’s of layers from raw renders and photos and trying them fit together, finding a right light, balance between mood and final vision of look, that’s really challenging you. Most of the people thinking that magic of creation great artworks and 3d graphics render or artworks is in Photoshop. Believe me, that’s not right, Everything is coming from inside thinking, mind and what’s exactly you produce… Everybody has it, they just don’t realise or don’t understand it. The software is only a tool, an idea and making from those tools that’s tha main point. This kind of projects always fascinate me! It’s very futuristic, nice job!